Having reunited the team onboard Xplore on the morning of 14 Feb, Stephen, Shady and I motor-sailed the yacht round to Grytviken while the shore team started their recovery. This was a short and uneventful passage which finished alongside King Edward Point; just in time as the wind became increasingly intense over the course of the afternoon, threatening to pop the fenders as we got pressed against the jetty. As the team slowly emerged from their slumbers, blinking like moles breaking out of the ground on a sunny day, they were a little confused over where we were as we were rocking around as if we were still at anchor. The rest of the day was spent getting kit washed and starting the dry out before getting an early night, thankful that the wind had eased so there was no need for a watch to be kept. Well rested, we got up on 15 Feb eager to get ashore and find out what Grytviken had to offer – it turns out there’s a huge amount! At King Edward Point, the British Antarctic Survey team and representative of the South Georgia Government have been incredibly generous in their support to us, helping us out where they can and allowing us to use their facilities. It is a short walk to the Shackleton Cross on Hope Point – the group of fur seals crowded round the base preventing access to the photo of Shackleton’s team cached in the cairn. Grytviken itself is a pleasant stroll round the bay, although the young fur seals seem keen to prove themselves up for taking us on! The post office was opened up for us, which gave us the chance to see the Enduring Eye exhibition, brought over from the Royal Geographical Society in London and unveiled by Princess Anne last month. We then had a look round the museum, giving us a fascinating insight into the history of the island and its wildlife. The museum shop provided the AE16 team the opportunity to get souvenirs and made the museum team’s eyes gleam as we spent the same as a small cruise liner. Stephen knows the couple who run the museum well, which meant that we were invited through for tea and biscuits – a very welcome addition to the visit! Most importantly, we visited the cemetery to pay our respects to ‘The Boss’. Fittingly, it was Sir Ernest Shackleton’s birthday and we were joined by the crews from the other yachts in the harbour. 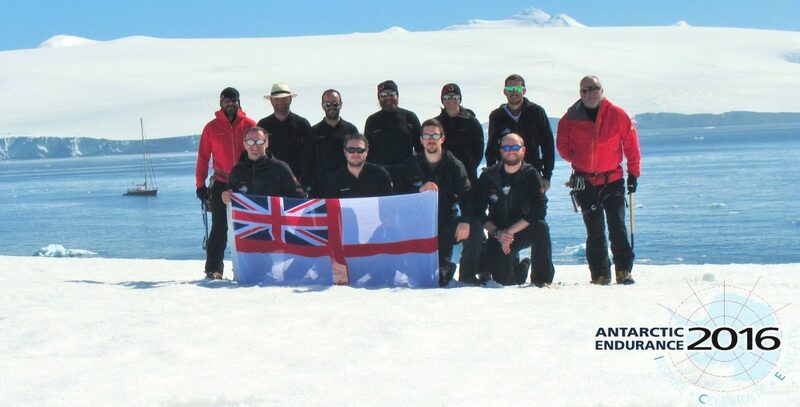 Josh had brought a bottle of “Shackleton Whisky” (MacKinlay’s Rare Old Highland Malt Whisky, as taken by Shackleton on his Nimrod Expedition of 1907) with which to make our toast to the man who inspired the whole plan for Antarctic Endurance 2016. We also made the toast on behalf of Tom Price, the Assistant Surveyor in South Georgia in 1955-56. Having finished the whisky and poured a little over Shackleton’s grave, as is the tradition, it was time to return to the Xplore for dinner and a celebration!